SPACEPORT NEWSDecember 19, 1997 Page 2 Kennedy Space Center looked to past, present and future in 1997 Editors Note: Cover photo shows the launch of STS-87 in November.In 1997, Kennedy Space Center paid allegiance to the past, retained a firm grip on the present, and positioned itself for a challenging future. KSCs seventh center director, Roy Bridges Jr., came on board March 2, and wasted no time in putting together a top management team which developed a strategic plan and road map for KSCs future through 2025. Joining him in leading all aspects of center operations are Loren Shriver, deputy director for Launch and Payload Processing; James Jennings, deputy director for Business Operations; and JoAnn Morgan, associate director for Advanced Development and Shuttle Upgrades. By years end, eight Space Shuttles had lifted off, carrying 53 crew members into space, logging more than 34 million miles and taking several major payloads into orbit. In addition, KSCs Expendable Launch Vehicle team supported three missions carrying NASA payloads, including the Cassini spacecraft and attached Huygens probe to Saturn. The diversity of tasks undertaken by the KSC work force reflected the centers commitment to keeping the Space Shuttle operational, while positioning itself to support future missions and launch vehicles. As one team of KSC employees began the meticulous process of developing a new launch processing and countdown system to replace the s-era original, another was taking steps to improve the efficiency of the nearly two-decade-old Shuttle transportation system. Yet another group welcomed the first U.S. element of the International Space Station to the center and initiated preflight processing for its launch in 1998. At the same time, the center continued to make safety its top priority, while streamlining operations and the work force to prepare for the future. 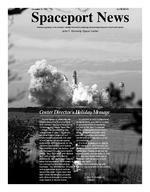 Kennedy Space Center is in a unique position to carry the U.S. space program into the next century, said Bridges. Our work force has no equal in the launch processing and countdown business, and our ability to look to the future and prepare for the natural evolution of missions and technology will stand us in good stead in the coming years. While we look forward to preparing for the on-orbit assembly and operation of the International Space Station (ISS) beginning next year, we also look forward to the challenge of what lies beyond, be it a return human mission to the moon or the first crewed expedition to Mars. Well be ready.Space Shuttle upgradesKennedy Space Center provides major contributions to NASAs four-phased plan to assure safe and continuous operation of the Shuttle fleet through the year 2012 and to incorporate major improvements through 2030. Phase One prepared the program for the ISS and is well under way, with the only remaining projects being the new super lightweight tank and the Block II Shuttle main engines. Upgrades under Phase Two are highvalue projects which dont change the vehicle configuration significantly. At KSC these include the development of the new Checkout and Launch Control System (CLCS), which will reduce launch processing time while lowering some operational costs by 50 percent. Other KSC development projects invest in systems design, technologies and concepts such as the Integrated Vehicle Health Monitoring (IVHM) flight technology demonstration, use of fiber optics in flight systems to reduce vehicle cycle time, and less toxic Thermal Protection System waterproofing materials for a safer workplace. Phase Three includes replacing Auxiliary Power Units, hydraulics, fuel cells and avionics; eliminating toxic propellants; and adding a new IVHM system. Phase Four would incorporate new flight elements such as a Liquid Flyback Booster. KSC engineers are contributing to all these efforts. KSC also is leading an effort to develop methods for reduction of Shuttle payload bay reconfigurations between flights, allowing up to 15 flights a year. Most of these projects have application to potential new flight systems as well. Shuttle mission highlightsSeven Shuttle missions were planned, but an eighth, STS-94, was added as a reflight of the STS-83 mission with the Microgravity Science Laboratory-1 payload. STS-83 was cut short by 12 days because of concerns about a fuel cell. The STS-94 mission three months later was ROY Bridges Jr. became the seventh director of KSC in March. Here, the former Shuttle astronaut (at left) greets the STS-87 flight crew. SPACEPORT NEWSDecember 19, 1997 Page 4 1997 KSC Christmas Coffees Headquarters IAN Owens (from let), Cynthia Van Valkenburgh and Charles See all of USA share some punch in front of the long row of mission plaques hanging in the LCC lobby. HOSTESSES Karroll Purer (from left), Cath y Penny Young and Sandy Walsh served r e cheer at the LCC coffee. CENTER DIRECTOR Roy Bridges and his wife Benita (far right) enjoy their first KSC Christmas coffee. With them in Headquarters are (left) NASA retiree Bill Martin, and Barbara Lockley, executive assistant to the center director. FLIGHT crew nurse Deborah Ghiotto (right) will receive a master of science degree in nursing from the University of Florida this month. Note that the O&C Christmas tree is decorated with mission crew patches. LEFT KSC DEPUTY Director for Business Operations (right) Jim Jennings and his former c worker, retiree Darwin Brown, share a light mo m at the Headquarters coffee. FORMER KSC senior manager George English (from left) visits with space program father-and-son retirees John Miley Jr., and his father, John Miley, at the LCC coffee. OLD FRIENDS from the payloads world were glad for an ad hoc reunion at the O&C coffee. From left are Jeri Smith, former Payload Operations Director John Conway, current Payload Processing Director Bobby Bruckner, and Elliott Zimmerman of Payload Processing. NASA curren t PUBLIC AFFAIRS Secretary Arden Belt of NASA served as a hostess at the Headquarters coffee. Enjoying the refreshments are (from left) United Space Alliance (USA) employees Linda Daniel, Jennifer Hall and Carl McManus. SPACEPORT NEWS December 19, 1997 Page 5 Launch Control Center Operations and Checkout Building JOY Huff (left) and Suzanne Cunningham, both of NASA, enjoy the LCC coffee. y Pope, Chris Weaver, e freshments and good c om ent JEAN Rhodes of NASA and NASA retiree Ann Watson reminisce together. Behind them at left is Warren Wiley, deputy director of Engineering Development. NASA retirees Renate Trantham and former Launch Director George Page attended the Headquarters coffee. BIOMEDICAL Office Director Dr. Irene Long (left) accepts refreshments from hostess Mary Conklin at the LCC coffee. COFFEES organizer Barbara McCoy of NASA and Center Director Bridges were present at all three to welcome current and former employees. CHIEF Financial Officer Dave Flowers (from left) and Quality Assurance Director Chris Fairey were present at the Headquarters festivities. RETIREES Chester Wasileski (from left) and Jim Phillips, and Shuttle Processing Director Bob Sieck were glad to share some memories at the Headquarters coffee. BOEING North American executive Lee Solid, KSC Deputy Director for Launch and Payload Processing Loren Shriver and NASA retiree Muriel Jernigan visit at the LCC coffee. retiree Ed Rock (left) chats with Leon Wichmann, a t NASA employee, at the Headquarters coffee. SPACEPORT NEWSDecember 19, 1997 Page 6 King, Roe named to succeed retiring Launch Director Harrington Roe Following an expedited design and KSC implementation process, enhancements to the Shuttles fuel cell instrumentation system are on a fast track to completion. In fact, Shuttle Columbias modifications are complete and were flown on the just-completed STS-87 mission. The system worked like a champ on its first flight, reported Jack Fox, KSC Fuel Cell Monitoring System (FCMS) integration lead. The prelaunch, on-orbit and postlanding fuel cell shutdown data was successfully acquired and looked fine. The FCMS now provides the launch team with an increased capability for assessment of fuel cell health prior to commitment to launch as well as increased visibility during on-orbit operations. Orbiters Discovery and Endeavour are undergoing their upgrades at KSC, and Atlantis will see the same fuel cell monitoring modifications performed at the Palmdale, Calif., orbiter maintenance facility during its almost 10-New Fuel Cell Monitoring System exceeds expectations on first flightmonth Orbiter Maintenance Down Period. Prior to the shortened flight of Columbia on STS-83, KSC Shuttle engineers were already studying ways to improve vehicle health monitoring with a focus on fuel cells. When STS-83 mission controllers saw what would later be defined as unclear voltage readings from Columbias fuel cells, they erred on the side of caution and brought the Shuttle home early. A subsequent Shuttle program desire for more refined fuel cell data before and after launch led to the Shuttle Launch Director Jim Harrington has announced his retirement effective Jan. 2. He will be succeeded in the launch directors position by Shuttle Processing Deputy Director David King and Process Engineering Director Ralph Roe. The senior member of the Shuttle launch team during the three-day countdown, the launch director makes the final determination to launch. He also oversees prelaunch preparations at the space center as well as KSC landing operations. Since being named launch director effective Jan. 22, 1995, Harrington has overseen 22 successful Space Shuttle launches. The naming of two people to succeed Harrington will provide needed depth to the launch director function, noted Sieck, himself a former launch director. To put it in football terms, he said, we want to have more depth on the bench. King will have the assignment for a period of about six months to a year enough to encompass at least three or four Shuttle launches after which Roe will serve in the position for a similar length of time. The first launch which King will oversee will be STS-89, the eighth Shuttle-Mir docking flight, set to launch in January next year. Assessments will then begin to determine if a third person should also be trained in the position, or whether two is enough. Imposing a time frame on the assignment does not mean King or Roe are serving in an acting capacity, Sieck noted.Harrington KingLunar Prospector nears Jan. 5 launchThe Lunar Prospector spacecraft is now at the Astrotech spacecraft processing facility in Titusville, undergoing final preparations for a Jan. 5 launch from Complex 46 on Cape Canaveral Air Station. Lunar Prospector will circle the moon in polar orbit for a full year, mapping the entire lunar surface from an altitude of about 62 miles. By contrast, the highly successful Clementine mission orbited Earths nearest celestial neighbor at an altitude of about 249 miles. Lunar Prospector carries five science instruments andWORKERS at the Astrotech plant uncrate Lunar Prospector, a compact spacecraft which will weigh only 660 pounds when fully fueled.six experiments. It will map the moons composition, gravity fields, magnetic fields and resources. It will confirm whether there is water-ice on the moon, a finding suggested by recently published Clementine radar data. Lunar Prospector is a NASA Discovery Program mission, aimed at implementing NASA Administrator Dan Goldins philosophy of faster, better, cheaper planetary missions. Liftoff aboard a Lockheed Martin Athena 2 rocket currently is scheduled for 8:31 p.m. It will be the first launch from Spaceport Floridas newly refurbished Pad 46. installation of off-the-shelf hardware and configuration changes in the crew module and orbiter midbody. Managers will now be able to see beyond a general voltage measurement of the orbiters three fuel cells and more accurately diagnose fuel cell health with insight into each cells 96 substacks. Early involvement of KSC engineers and technicians was critical to the success of this Shuttle enhancement, and the quick implementation on Columbia will serve as a prototype for timely execution of future orbiter upgrades, Fox observed. JIM KING, United Space Alliance mechanic, prepares to tighten a bracket to hold a PCM unit in the midbody bay 1 area of Discovery, undergoing preflight preparations in Orbiter Processing Facility Bay 2. All four orbiters will be outfitted with the new monitoring system. ONE of three FCMS Pulse Code Modulation (PCM) units as installed near a fuel cell in midbody bay 2 on Columbia. SPACEPORT NEWS December 19, 1997 Page 7 Center happeningsSPECIAL THANK YOU KSC senior managers, including Center Director Roy Bridges, paid tribute to civil service employees generosity and caring during the 1997 Combined Federal Campaign. The center exceeded its dollar goal in the most successful fund drive ever. To make their thank-you fun for everyone, the managers donned ponytails, gold earrings and other unusual garb. Is that the center director in those dark glasses and ponytail? NEW ADDITION The Air Force missing man formation flies overhead in tribute as family and guests gather at the Space Mirror located at the KSC Visitor Complex, where U.S. Air Force Maj. Robert Lawrences name was added during a ceremony Dec. 8. A veteran pilot who had logged more than 2,500 flying hours, Lawrence lost his life in a training accident 30 years ago. He already had been accepted to the Air Force Manned Orbital Laboratory Program (MOL) in June of that year. His name becomes the 17th added to the Mirror, a memorial to those who have given their lives in the quest to explore space. The Astronauts Memorial Foundation oversees the Mirror as well as the adjacent Center for Space Education. EMPLOYEES of the Month Honored in December were, from left, Juan Busto, Checkout and Launch Control System Office; Dorothea Worthy, Administration Office; Nicole Scarborough, Safety and Mission Assurance; Henry Schwarz, Shuttle Processing; Laura Thayer, Chief Financial Officers Office; Terry Taylor, Public Affairs Office; Tracey Federickson, Engineering Development; Ann Gary, Installation Operations; and LaVerne Woodard, Logistics Operations. Not shown are Albert Mariano, Payload Processing; Cynthia Jarvis, Procurement Office; and Tammy Belk, Space Station Hardware Integration Office. KSC FOREIGN OBJECT DEBRIS (FOD) PREVENTION employee of the quarter United Space Alliance Supervisor Tim Miller presents a commemorative plaque to Mary Repass-Friend for her FOD prevention efforts at KSC. A member of the FOD Prevention Board for a little more than a year, she was praised for her costreducing initiatives and timely efforts to support the boards function. WHIRLING WINGS A flock of Purple Martins munch on holly berries near the northwest corner of the Merritt Island National Wildlife Refuge. Purple Martins are the largest members of the swallow family. Erecting Martin houses to attract the birds is a custom dating back to the earliest European settlers who settled in this country and before them to the Indian tribes already here. INTERNATIONAL VISITORS A delegation from India visited KSC in November in honor of STS-87 Mission Specialist Kalpana Chawlas flight on Columbia. From left are L.S. Satyamurthy, Indian Space Research Organization (ISRO) counsellor, Embassy of India; T. P. Srinivasan, Hon. Deputy Ambassador, Embassy of India; Shirish Patel, KSC/NASA Payloads Processing; Center Director Roy Bridges; Bobby Bruckner (partly hidden, in light shirt), Payloads Processing Director; and Dr. Ashok Jain, Science and Technology Counsellor, Embassy of India.The delegation presented the center director with a bronze lamp called a Lakshmi-Dweepa, lit on special occasions to mark the beginning of a journey. The gift honored Chawla and her spaceflight, as she became the first woman of Indian birth to fly in space. Chawla was born in Karnal, lndia, but is now a U.S. citizen. KSC Engineering Development Director Sterling Walker, Larry Schultz of the NASA Advanced Programs Office at KSC, and Ravi Margasahayam of DYNACS Engineering Co. were instrumental in arranging the delegations visit.